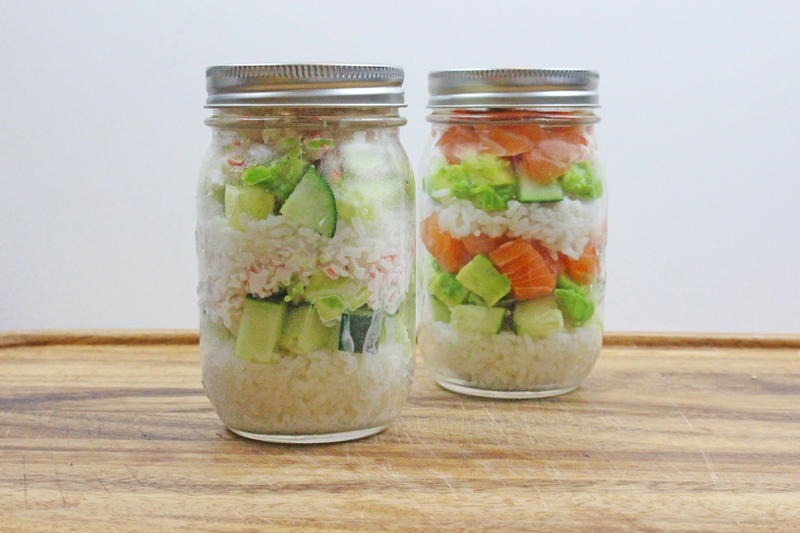 Take your favorite sushi rolls on-the-go with these California and Salmon Sushi Jars! In a large wooden bowl, pour Marukan Seasoned Gourmet Rice Vinegar evenly over pre-cooked rice, fold to combine. Let rice cool to room temperature. Place chopped crab in a small bowl. Add the mayonnaise and mix together. Then add the Marukan Seasoned Gourmet Rice Vinegar and mix. Add Marukan Seasoned Gourmet Rice Vinegar to cubed salmon and mix together. In a 16 oz. Mason Jar, add two large scoops of rice, 2 small spoonfuls of cucumber, 2 small spoonfuls of avocado, and 3 spoonfuls of crab mix. Repeat each step until mason jar is full. Garnish with seaweed and set aside. In another 16 oz. Mason Jar, add two large scoops of rice, 2 small spoonfuls of cucumber, 2 small spoonfuls of avocado, and 3 spoonfuls of cubed salmon. Repeat each step until mason jar is full. Garnish with sesame seeds, seaweed and set aside. Store in the fridge and enjoy as a tasty on-the-go lunch! For extra flavor, enjoy with Marukan Premium Ponzu Soy Dressing with Sudachi Citrus.